This is one of 4 apartments in this castle of the 14th century. The castle is well situated in between the town of Canet on one side and Perpignan on the other. This is the perfect place for those seeking calm and relaxation. But as a consequence, I would recommend having a car, even though there is a bus stop only 200m from the house. You'll be only 5min drive from the closest beach of Canet and its thalassotherapy, also close to Ste Marie, Toreilles, Barcares. And at the same time, it is only 10 min drive from Perpignan downtown, and from the golf of St Cyprien. If you need to go shopping, there are 2 shopping malls at only 5 min drive from the castle. Apartment B: this is a 130 m2 apartment, accessible to handicaped people, with 2 big windows facing south, and the private patio facing the tower of the castle. The apartment consists of a big living space with high ceilings, and a very nice wooden roof separating from the apartment above. There are 3 bedrooms with double beds in each and another bunk bed in two of the bedrooms. Each bedroom has its own adjacent bathroom. For cleaning, there is a washing machine and a dishwasher. Corbières: this is a 130 m2 apartment, with a big sliding doors, a big glass roof, and a patio with barbecue in front of it. The apartment consists of a big living space with high ceilings. There are 3 bedrooms, 3 bathrooms, 2 restrooms and the kitchen. Bernard: this is a 60 m2 apartment with a huge window toward the Canigou. The apartment consists of a big living space with high ceilings. There is a convertible couch in the main room, a double bed in the bedroom and large shower. And for those not willing to waste too much time cleaning, there is an automatic dishwasher in the kitchen, and the washing-machine is in a closet. The swimming pool and its surroundings, with the hammocks and outdoor seatings are shared areas for all guests. While there is a terrace/patio for each apartment with its own fireplace in front of each apartment. Last but not least, each apartment has 2 parking spots. 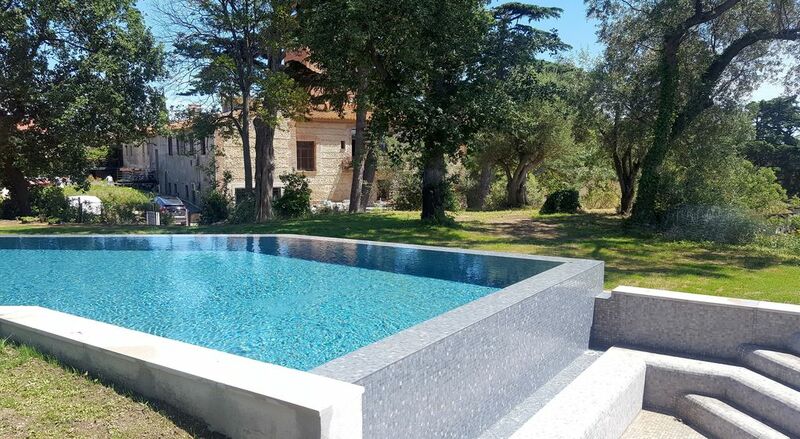 In a quiet environment conducive to relaxation , this castle typical Catalan will seduce you. Depending on the time it will be even possible to climb up the tower for a panoramic view of the region. Indeed, on the highest point of the plain, the terrace of the tower allows a view to: Perpignan, Canet, Argeles , overlooking the sea and the center of Perpignan, the alberes the Corbieres , Canigou. .. The castle is located in the town of Perpignan, on the border with Canet en Roussillon . It is on the bus line 6 ' - Perpignan Canet ' which serves at the stop ' Mas Miraflors . Canet Beach is just 5 min away. Perpignan downtown is about 10 min away. Its location allows quick and easy access to various attractions in the area (beach, harbor, mountain , ski, spa ... ) and many shopping centers which are just 5 minutes away. And access to the fast lane in the direction of the mountain is very easy. Golf: The 18 hole golf course at St Cyprien is about 10min drive from the property. It also offers a spa . Ski: takes only 1 hour .